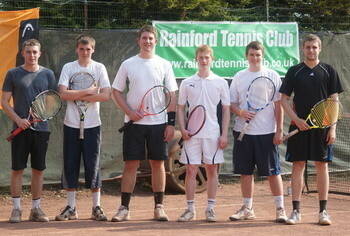 Rainford Tennis Club’s men’s teams battled it out this weekend in the Liverpool Tennis League with the First Team coming out with a 5-1 victory over the Second Team. Men’s Captain, Dave Hillier and Conor Porteus claimed a crucial victory in the first rubber, against John Machin and Jon Fenney, with a three-hour 6-7, 7-6, 10-8 win. Andy Corish and Simon Webster won their first match against Alex Gillespie and Jamie McCafferty, whilst Rob Jones and Andy Gillespie won both their matches, including a third set tiebreak win over John Case and Steve Vincent to seal the 5-1 win. The match, which took place in glorious sunshine at the Jubilee Recreation Ground, was the first time in the Club’s history that two Rainford teams have played each other in a competitive match.